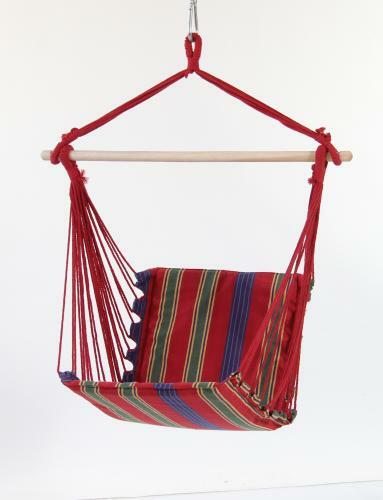 The Belize Hanging Chair is a comfortable, fun addition to our Amazonas product line of hammocks and hanging chairs. Featuring a padded seat the Belize Chair comes in vibrant colors and is easy to get in and out of. A perfect addition to a home, dorm, camp or backyard, the Belize Chair is a favorite of anyone who sits in one. Dimensions: 40"W X 48"H X 20"D . Weight: 4.25 lbs. Weight limit: 240 lbs. "Thank you for your help with our questions and patience to figure out what equipment we needed to match what we already had in possession. You are terrific and knowledgeable."